Harry J. Elam Jr. became the Freeman-Thornton Vice Provost for Undergraduate Education five months after the university announced plans for a comprehensive review of undergraduate education. 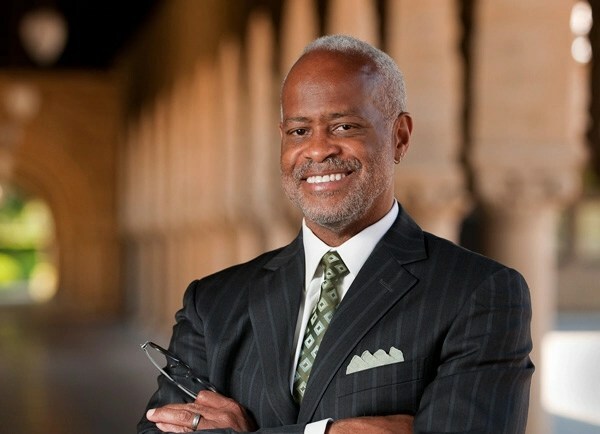 As the oldest son of the first black chief justice on the Boston Municipal Court, Harry J. Elam Jr. long thought he would follow in his father’s legal footsteps.Until Elam realized – as a senior at Harvard College – that he was more interested in the drama of the courtroom than the law practiced within its walls.“When I was going off to UC-Berkeley to get a PhD in dramatic arts, I asked my father if he was disappointed in that choice,” Elam, the new vice provost for undergraduate education at Stanford, recalled during a recent interview.Elam got a surprising answer during that conversation more than three decades ago, a reply that seems to astonish and delight him even to this day.“My father said that” – here, Elam burst out laughing – “the one thing he would have been if he wasn’t a lawyer was an actor.”His father, who is now 88 years old, had already demonstrated his skill as an impresario by filling the house when his two sons – Harry, then a senior in high school, and the late Keith Elam, then in seventh grade – helped mount a production of A Medal for Willie, written by William B. Branch.“The Family,” a black youth theater troupe at Noble and Greenough School – the private school both sons attended – staged a summer production of the 1951 play, in which a southern African American woman rejects the medal posthumously awarded to her soldier son for bravery during World War II.“My father sent all his friends – jokingly – summonses to come to the play,” Elam said, sitting at a small round table in his office in Sweet Hall one recent summer morning. “For two nights, 500 people came – in the summer in Boston – to see A Medal for Willie, which my brother had a small part in.”Elam said his 81-year-old mother, who was the co-director of library programs in the Boston public school system, took him to plays as a child and encouraged his interest in theater. “Nothing was more important to her than reading,” he said. Elam, who joined Stanford’s drama faculty in 1990 and is now the Olive H. Palmer Professor in Humanities, said acting was a big part of his undergraduate years at Harvard. L.A. Cicero Harry Elam prepares for a lunchtime meeting while going over the rest of his schedule with Administrative Associate Anne Dazey. 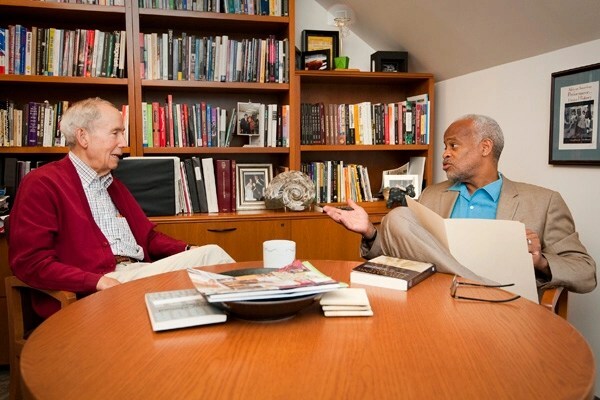 L.A. Cicero Tom Ehrlich, former dean of the Stanford Law School, discusses undergraduate education with Elam.